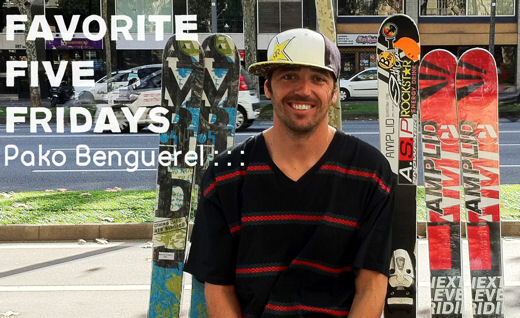 On the first Friday of December 2011 the Favorite Five honours go to Amplid Cartel rider and Spanish freeski godfather Pako Benguerel. When he’s not showing the up-and-coming kids how freeskiing is done it sounds like Pako’s is cleaning-up after his dog, one of the five possessions Pako can’t live without. My dog - I love my dog, he’s the most loyal animal. Besides being a great companion he travels around the world; eating, peeing, shitting, and sleeping. Freeskiing – Freeskiing is the sport that has given me the best feelings of my life and wouldn’t change my involvement and dedication to it for anything in the world. Amplid Syntax skis – Super lightweight, reactive, stable and agile; actually I don´t want to bore you with talking about them anymore, because I’ve only got good things to say about them. Basically they’re like a thoroughbred horse, but at the same time they’re really easy to control. My Passport – Every time I see my passport in my hands it’s because I’m about to go on another action filled adventure, that’s why I love my passport. My iPhone - Always is there when I need it… and what can’t you do with it? Friends’ calls, emails, music, diary, angry women and the list goes on.